Set menus strike horror into the hearts of some people. That pared-down list of culinary offerings signifies a lack of choice; a limit on your tastebuds. This is sometimes undeniably so. However, set menus can also represent significant savings: they can be a chance to check out what’s on offer at a ritzy restaurant while keeping your spending on the down low. Personally, I don’t mind eating early and picking from a reduced menu if it enables me to satisfy my stomach with chi chi cuisine at a fair price. The aptly-named High Table sits inside the High Street’s Eastgate Hotel. Popular with tourists due to its prime location, it’s also increasingly name-checked by local residents on Twitter. I visited a number of years ago and remember being impressed by the high quality of the traditional dishes served, but memories of a rather stuffy interior delayed my return visit until this year. Following a facelift, the High Table is no longer a staid hotel dining room: the traditional space has been given a modern touch with fashionable furniture and light colours. It met with my mother’s approval: and that’s no mean feat. Mrs T also approved of the menu, too: at The High Table, prix fixe merely restricted to the earlybird slot. In addition to their excellent value Monday to Saturday offer (£10.95 for two courses at lunch and from 6 until 7pm), there’s also a slightly higher priced set menu on Sundays until 2 (two courses for £13.95, three for £16.95). With four options on offer for each course, there’s slightly more choice than on most set menus, and I noted to my satisfaction that two of the starters were vegetarian. 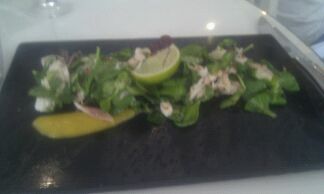 Over a basket of fresh warm bread, we perused the options.Mr and Mrs T both chose smoked trout salads with mango, chilli, lime and coriander to start. Immaculately and artistically presented, they were what Mrs T termed ‘proper starter sizes’: no spoiling your appetite here, these entrées were designed to leave you salivating for more rather than satisfied. I suppose serving so many set menus encourages balanced portion sizes. The salad’s ingredients worked harmoniously together to create a fresh, summery flavour combination rather than an overpowering culinary equivalent of the tower of Babel. 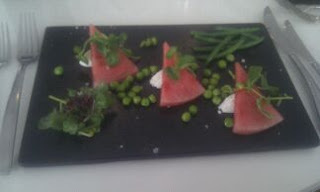 My watermelon and ricotta salad with podded peas and green beans was also perfectly presented and an interesting summer dish, but I did feel that the taste of the watermelon dominated the cheese, so perhaps an extra flavour element would have been welcome here. Much to Mr T’s dismay, there was no roast beef to be had by the time we sat down, so the traditional roast was substituted for chicken. As a chap who likes his hearty meals (a little too much, Mrs T might say), my dad was a little disappointed by the portion size but once again impressed by the presentation. The rosemary-infused roast potatoes also helped to win him around. Mrs T’s pork belly with apple purée and Madeira jus looked decidedly unappetising to my vegetarian eyes, but she assured me it was well-cooked and melted in her mouth, although the crackling could have been crispier. 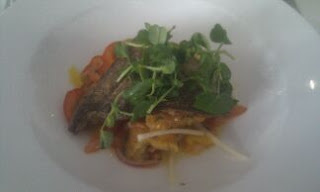 My pan-fried Cornish bream was perfectly cooked, light and flaky, combining well with the accompanying panzanella salad (although this was just a touch too oily). With friendly and efficient service and tasty and interesting dishes served in an inviting setting, The High Table deserves to steal another High Street institution’s crown. 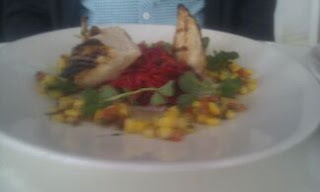 The price-quality ratio was spot on, and the ample availability of set menus is a definite winner in my book. However, if the portion sizes on the a la carte menu are similarly sized, you’ll definitely need more than a main to satisfy your stomach – even if your appetite isn’t as healthy as Mr T’s. The High Table is at71-73 High Street, OX1 4BE. Tel: 01865 248695.